I get kidded a lot about the shoes I wear. I’ve never been one who has a love for shoes–even though I birthed a few with shoe fetishes. I’ve always been more comfortable with, well, being comfortable. My shoes of choice are typically well-worn tennis shoes or soccer flops. Living in Florida, where wet happens spontaneously, the rubber flops work wonders when it rains. Or mowing the lawn. Or I’m too lazy to tie a lace. Fashion? Not so much. Easy to slip into. I’m not especially focused on the state of my feet. I’ve gotten two pedicures in my life. The first time a friend took me, and it was a sweet and painless experience. The second time was before one of my daughters’ weddings. All of us gals went together so we’d have happy feet for the big day. Not so painless. The gal cut so much calloused skin from my feet that it was painful walking down the aisle. No one has touched my feet with those scraping, cutting things since. And because they benignly hang out the ends of my flops or are covered with the leather upper of my tennis shoes, my toenails get the cold shoulder–footer?–from me. I just don’t think about them. 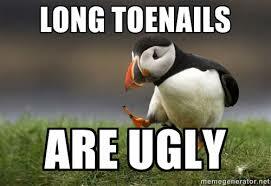 Until my toes complain because the nails are getting too long and are scraping toe skin. I cut them to the quick and ignore them for another month. 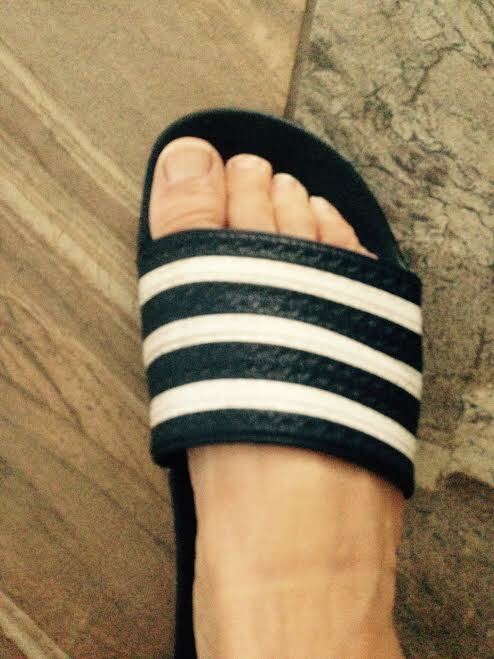 Focus on my toes–or lack thereof–has made me aware of other ignored parts of me. There are areas of my heart that I treat much like I do my toes. I consider myself a low-maintenance kind of a gal. Hence no fru-fru nail color. I often wear that as a badge of honor. But I’ve noticed lately that I’ve ignored areas of my heart that have needed attention. The obvious whines from my soul have had to do with worry over the coming year. Concern for my family and their hurts and needs. People I work with who are in pain and transition. When folks ask how I’m doing, though, I typically smile and say, “Fine.” Life, after all, is what it is. I want to be genuine. I don’t want to deal with my messy. Tamp it down. No sweat. Badge of honor. Ignoring truth is no badge of honor. Like a doctor once reminded me, there’s no glory in pain. I might be able to hide my stuff from the world, but God is intimately aware of everything that’s going on in me and with me. I can’t hide from Him. Don’t really want to. Yes, I’m weary of my mess being front and center. But God encourages me to bring it to Him. Like a pedicure for my heart. (A coronaracure?) He heals. With tenderness. My toes may not be pretty, but I’ve got a Master at work on making my heart look great. Second photo courtesy of memegenerator.net. Posted by daylerogers on August 27, 2015 in Uncategorized and tagged comfortable, concerns, fears, feet, God, Jesus, pedicures, shoes, soccer flops, tennis shoes, worries. Thank you dear long distant friend! You spoke to my heart this morning. If only we could figure it all out & make it all right, but no – we can’t. I think God has an easier way: just give it to Him. Thanks for the reminder. So miss you! Whooops, meant 30 years running THE conference! I live in fear of someone with tough love sending a farrier to my house! I love how you always tie things together, Dayle. Amen, the heart and even moreso the soul cannot be neglected. That Master at work on your heart, and your willingness to embrace His work (even when you don’t like it) is a testimony to your character. Many people can have “pretty toes” but at the end of the day, it’s the heart that really matters. And yours, my friend, reflects Jesus beautifully.